Richard Garriott, the 1st second-generation astronaut and only sixth private individual in history to travel to space, returned to Earth October 23 after launching to the International Space Station on October 12. Garriott dedicated his mission to scientific and environmental research, and educational outreach. Here, Garriott assists biotechnology company ExtremoZyme by conducting Protein Crystal Growth (PCG) experiments. Space Adventures, Ltd., announced that its orbital client Richard Garriott and his crew successfully landed in the Kazakhstan steppes after a visit to the International Space Station (ISS). Garriott returned to Earth aboard the Soyuz TMA-12 spacecraft with Expedition 17 crewmembers Sergei Volkov and Oleg Kononenko, who both spent six months aboard the ISS. Garriott, son of NASA astronaut Owen Garriott, made history during his mission by becoming the 1st second-generation astronaut. The flight back to Earth marked another historical milestone as Garriott traveled with the 1st second-generation cosmonaut, Sergei Volkov. "This mission to the ISS fulfilled a lifelong dream to experience spaceflight as my father first did 35 years ago; it's an honor to be the first American to follow a parent into space," said Richard Garriott. "This experience made possible by Space Adventures from my training in Star City, to lift-off, orbit and finally docking with and staying on the ISS -- has been more gratifying than anything I could have ever imagined." Garriott continued, "While in space, I had the opportunity to conduct scientific experiments and environmental research, but what was most rewarding was speaking to students. Growing up in an astronaut family, I firmly believed that every person could go to space, and now I have. I took this opportunity to inspire them with my adventure and let them know they can achieve their wildest dreams as well with hard work and perseverance." Eric Anderson, president and CEO of Space Adventures, said, "We're proud to have assisted Richard in achieving his lifelong goal of spaceflight. This history-making mission not only made Richard the 1st second-generation astronaut, but also opened the space frontier to commercial opportunities, which truly demonstrates the reality of private space exploration." On October 12, Garriott launched aboard the Soyuz TMA-13 from the Baikonur Cosmodrome in Kazakhstan. He joined Expedition 18 crewmembers Mike Fincke and Yuri Lonchakov, for the flight. They arrived at the space station on October 14 and were greeted by the Expedition 17 crew. Garriott communicated with students associated with the Challenger Center for Space Science Education via a NASA-sponsored teleconference, HAM radio downlinks and through videotaped experiments. Garriott also conducted a HAM radio downlink and two science experiments designed by primary and secondary students from the United Kingdom in partnership with the British National Space Center. In cooperation with NASA, Garriott performed a series of experiments that examined the physical impact of spaceflight on astronauts. Garriott observed the reaction of the eyes to low and high pressure in a microgravity environment; the effects of spaceflight on the human immune system; and astronauts' sleep/wake patterns and sleep characteristics. On behalf of The Nature Conservancy, Garriott photographed a number of ecologically significant places on Earth. The photographs will be compared to shots taken 35 years ago by Garriott's father while in space. Together, Garriott and The Nature Conservancy will review the images to document how the Earth has changed in one generation. Garriott worked in cooperation with the European Space Agency to perform a series of experiments that observed early detection of osteoporosis, vestibular adaptation to G-force transitions and the occurrence of lower back pain. Garriott supported a number of commercial partners. He assisted the biotechnology company ExtremoZyme, co-founded by Owen Garriott, by conducting Protein Crystal Growth (PCG) experiments. Additionally, Garriott tested a SEIKO Spring Drive Spacewalk watch, specifically designed for use in space. Garriott also conducted a physics experiment as part of an initiative sponsored by DHL, planned as an educational contest that will take place at the DHL Innovation Center in Bonn, Germany. Garriott has been chronicling the details of his mission, from training to landing, on his web site Richard in Space with photos, video, audio, in-depth blogs and answers to questions posed by visitors to the site. 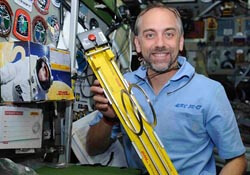 Now back on solid ground, Garriott will continue to share his experiences on his site, expanding upon his time aboard the ISS and providing insights into his landing and return to Earth. Last updated by jack on 26 October, 2008 in Travel News.